In the hilly and forested Bergiches Land, Solingen is a town just upriver on the Wupper from Wuppertal. Since the Middle Ages Solingen has had the nickname, Klingenstadt (City of Blades), and scissors, cutlery, swords and daggers were forged here for centuries. That culture hasn’t been lost, and is represented by an industrial-era forge, water-powered grinding mills that date back the Early Modern Age and an enthralling museum. 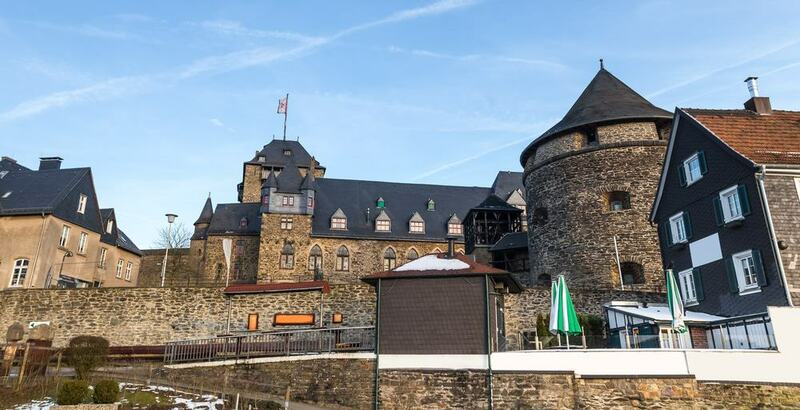 Schloss Burg is a lordly castle where the Counts and Dukes of Berg reigned in the Middle Ages, while Gräfrath is a timeless old town of adorable half-timbered houses. One of the most treasured historic sites in the Rhineland, Schloss Burg is a mountain castle over the Wupper Valley. In its early days Schloss Burg was the seat of the entire Duchy of Berg before this was moved to Düsseldorf at the end of the 14th century. The castle was almost demolished during a siege by the Swedes in the Thirty Years’ War and was left in ruins until the 20th century. Schloss Burg now holds a first-rate museum chronicling the history of the building and the Bergisches Land. The armoury has swords, harnesses, shields, chainmail from the 1000s to the 1200s, and there’s a room for the courtly hunts held at the castle from the 14th century. There’s also lots of applied art and handicrafts like typical local pewterware, furniture from1600-1900, a Flemish tapestry and liturgical sculpture. Since you’re in the “City of Blades” you have to dip into Solingen’s long knife-making history. And blades in this museum range from fearsome swords from the Middle Ages to rare Rococo cutlery. Presented in this former convent is the largest hoard of historical silverware in the world. Many of these examples were personal dining sets that people carried with them on their travels as inns never provided their own cutlery. There are pieces from a primitive piece of bone carved into a spoon, to laser-sharpened steak knives. You can also view a beautiful array of Art Nouveau table sets and track the changing cutlery trends during the 20th century. One grisly piece to look out for is the Richtschwert, a Medieval sword forged for beheadings. 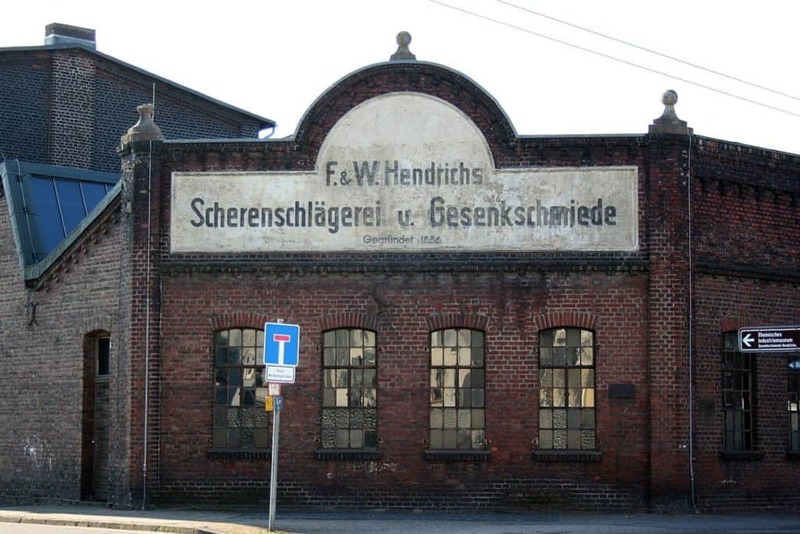 Managed by the LVR-Industriemuseum, which runs six sites in the region, Hendrich’s Drop Forge was founded in 1886 to manufacture precision tools from high-quality steel. One century after it opened the forge ceased production as it no longer met health and safety standards. Everything was left in place inside, so in 1999 the forge reopened as a museum and is a riveting trip into Solingen’s blade-making past. You can view the bulky forging dies, the heavyweight drop hammers, presses, milling machines, as well as all of the gear used by the factory’s toolmakers. Not only that, but the dressing room and lockers, washroom, office remain as they were, as does the Hendrich Brothers’ mansion that was built next to the factory. East of Solingen in the Wupper River valley is Germany’s highest railway bridge, 107 metres over the valley floor. Originally named for Kaiser Wilhelm, the steel-framed Müngsten Bridge was completed in 1897. The best viewpoint is from below at a park that opened in 2006. There’s a snazzy visitor centre where you can check out the history of the bridge, all wrapped in woodland and glades for family picnics. There’s a mini-golf course at the park, but maybe the most unusual attraction is the hovering ferry, the Schwebefähre. For a small price, from March to October, you can catch a man-powered ferry, suspended on cables over the Wupper. The ferry uses a pump mechanism similar to a railway handcar, and the ferryman is always grateful for some help from his passengers. As with most German cities, the Second World War took a toll on Solingen. But one place left untouched was the medieval old town in the district of Gräfrath. The streets around the market square are very pretty, and fringed by two or three-storey half-timbered houses from the 16th to the 18th centuries. The buildings are in the “Bergisches Haus” style and have beautiful slate facades, green shutters and lintels that are painted white, and now contain restaurants, cafes and ice cream shops. In the space of a few streets there are 120 listed monuments and the entire Altstadt is a conservation zone. The oldest building of all is St. Maria Himmelfahrt, a monastery church at the town’s highest point, dating back to 1195 and revamped in the Baroque style in the 18th century. In stylish repurposed freight warehouses in Solingen’s Südpark is one of those weird museums that you have to see to be able to tell thestory. The “Plagiarius” award was created in 1977 to recognise the most flagrant counterfeit products on the market. And in 2007 the Museum Plagiarius was set up to showcase the worst cases, and explain the damage and dangers of counterfeiting. There are 350 fakes in all, shown side-by-side with their originals. These entail designer homewares, motorcycles, watches, toys, cutlery and electronics like Game boys. Sometimes it can be challenging to work out what’s real and what’s fake. 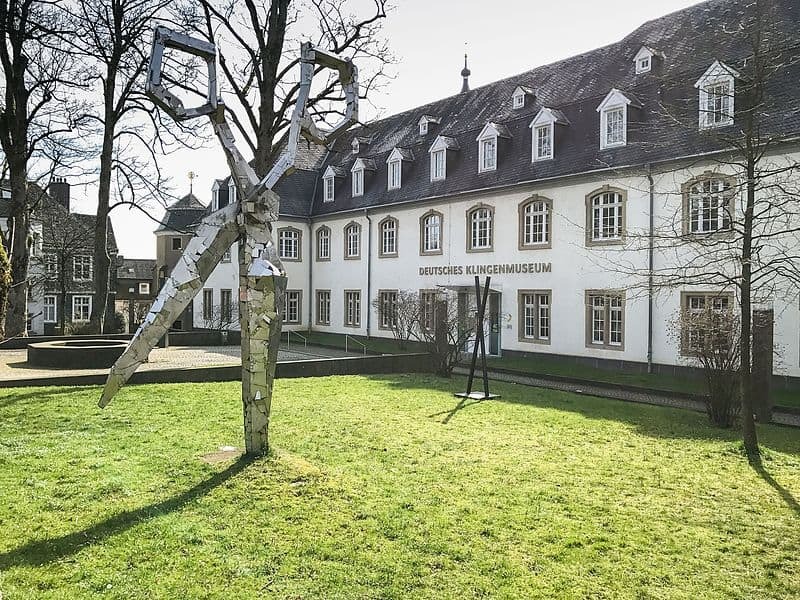 For a blast of culture, Solingen’s art museum shines for its works from the 19th and 20th centuries, by Anselm Feuerbach, the symbolist Franz von Stuck and the Impressionist Lovis Corinth. The museum is in Gräfrath’s exquisite town hall, which was conceived in the Art Nouveau style at the start of the 20th century and like the town around it is partially clad with slate. In 2015 the Centre for Persecuted Art (Zentrum für verfolgte Künste) opened here. It is the only exhibition in the world to focus on the works of artists persecuted by the Nazis and then the SED in East Germany. As well as boasting pieces by famous artists like Emil Nolde and Paul Klee, the centre’s aim is to highlight artists like Valentin Nagel, Milly Steger and Florenz Robert whose careers were harmed after their work was labelled “degenerate art”. Solingen still has two of the grinding mills that once littered the countryside. The best of these is Balkhauser Kotten, which is open as a museum, and has a working water wheel that still powers its whetstones and buffing wheels. The mill offers a privileged look into how Solingen’s blade-makers operated for hundreds of years, and if you’re lucky you’ll be able to peer over the shoulder of a craftsman to see how it’s done. The building goes back to the start of the 17th century and was in continuous use, sharpening scissors, swords, daggers, table knives and sheath knifes until the 1950s. This heritage tramway is actually in Wuppertal’s city limits, but is just ten minutes from the centre of Solingen. The line is short, making just seven stops in rural scenery, and runs on Saturdays all year round but also on Sundays in the summer months. The trams leave every 30 minutes and take just 14 minutes to get from the depot at Kohlfurther Brücke to Möschenborn on the other end of the line. The route is on the old Wuppertal-Solingen line, which was decommissioned in 1969. And the 33 cars that are kept in the depot were acquired from a host of German cities after their tramlines shut down, and date from the 1910s to the 1950s. In a secluded side valley of the Wupper near Schloss Burg is a dam that was topped out in 1904. The dam is in high wooded scenery and there’s a photo-worthy view from the top of this structure, which is designed like a medieval castle, an even has merlons and towers. For people interested in engineering, the Sengbachtalsperre was built according to the Intze-Prinzip, an engineering principle set out by the hydraulic engineer Otto Intze. The Sengbachtalsperre is a dam with an almost triangular cross section and a curved ground plan. The reservoir formed by the dam still supplies Solingen’s residents with drinking water more than 110 years later. 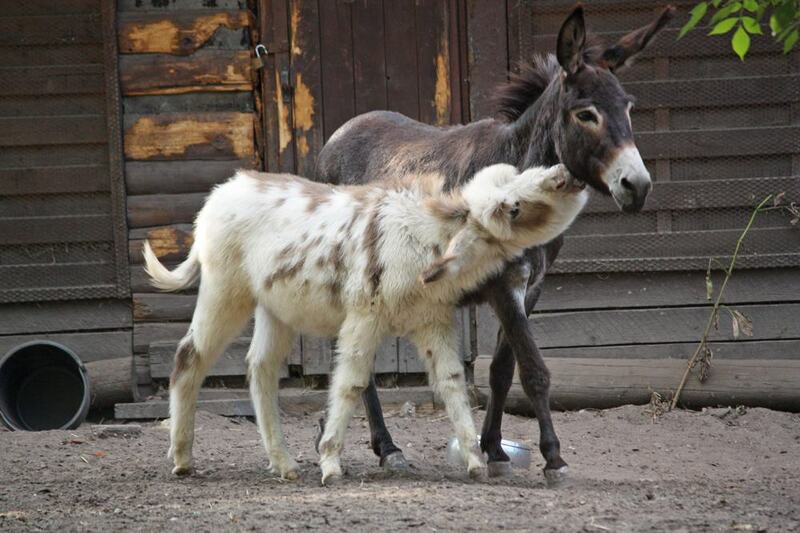 Just northeast of Gräfrath is a small but well-run zoo that little ones will enjoy. Tierpark Fauna has about 400 animals in three hectares, and these are a mix of domestic animals and smaller exotic species like llamas, porcupines, meerkats, nasuas, kangaroos, wallabies, lynxes, roe deer, fallow deer and moufflons. The park also has a terrarium where you can get up close to a variety of snakes, lizards, turtles and creepy crawlies. And like all good zoos, Tierpark Fauna has a petting zoo where kids can feed a small herd of tame dwarf goats. If you’re holidaying with kids you’re in luck as there’s another small zoo in Solingen. The Solingen Bird and Animal Park started out in the 1920s purely as an aviary, but down the years has opened lots of animal enclosures. Like the Tierpark Fauna these are for smaller species like wallabies, lynxes, raccoons, wild cats, raccoon dogs, maras and arctic foxes. Among the bird species are pied crows, white-necked ravens and palm-nut vultures, all from Sub-Saharan Africa. You can’t miss the chance to strike out in the Bergisches Land’s hilly countryside. 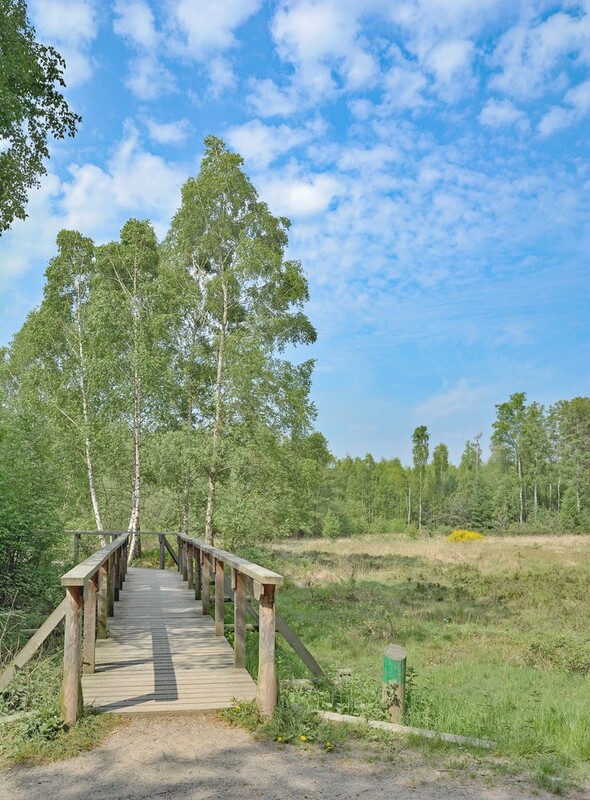 If you call in at the tourist office near the Museum Plagiarius in Solingen you can get hold of a map for this 75-kilometre walking trail that makes a complete loop around the city. And while 75 kilometres is too much to manage in a day, the walk is broken down into nine sections. One stretch leads you down and then up the high banks of the Wupper River, which have a mantle of fresh beech woodland. Some other things to see on the Klingenpfad are old mills, half-timbered farms and a castle. West of Solingen the Klingenpfad enters the Ohligser Heide(Ohligs Heath), a 147-hectare nature reserve that you can reach on the Rhein-Ruhr S-Bahn. The landscape is a system of meadows, moors, ponds, marshes and oak and birch forest, all coursed by little streams. If you’re on the hunt for somewhere to take a refreshing stroll rather than a proper hike this is the place for you. At the centre of the Ohligser Heide is the Engelsberger Hof, a former noble estate which for the last century has been a recreation area with playgrounds and a restaurant in the old property. Most hotels and traditional cafes in Solingen will lay on something called a Bergische Kaffeetafel. This is essentially a spread of sweet and savoury regional treats like ham, sausage, cakes, raisin bread, brown bread and pumpernickel, all to go with a pot of coffee. 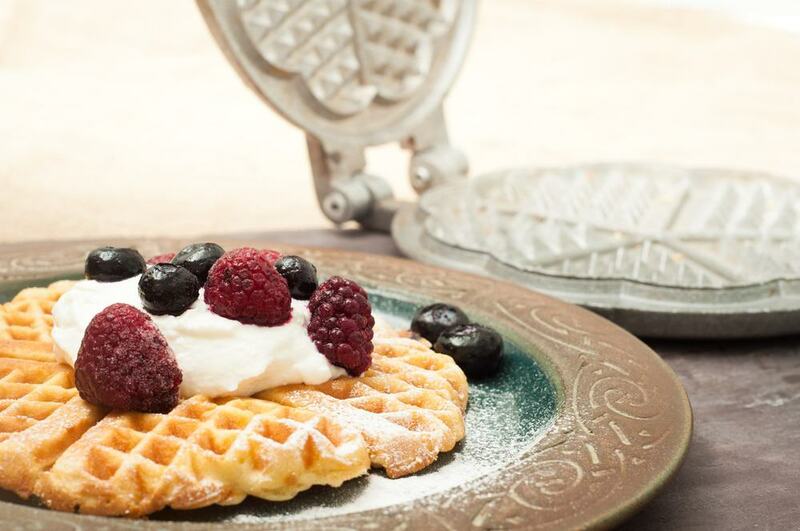 One of the tastiest specialties is Bergische Waffeln, which are heart-shaped waffles dusted with icing sugar, covered in a sour cherry compote and lots of whipped cream. The tradition goes back to at least the 18th century and was resurrected after the Second World War.